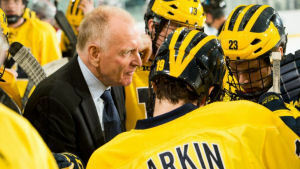 Red Berenson Retires at U. of M.
ANN ARBOR– It was announced today that Gordon ‘Red’ Berenson (77) retired as the Men’s Ice Hockey head coach for the Michigan Wolverines. In a joint appearance by Athletics Director Warde Manuel and Berenson they made the joint announcement at the Junge Center. . He will remain as a special advisor to Manuel. 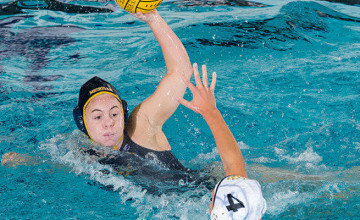 Michigan went 848-426-92 in Berenson’s 33 years, including the 1996 and 1998 NCAA National Championships. Berenson’s accomplishments behind the bench at Michigan put him among the greatest coaches in college hockey history. “I’ve thought about this for a long time and I think this is the right time and it’s the right thing to do for the Michigan hockey program,” said Berenson. “My heart will always be at Michigan and I look forward to the team taking the next step and making me proud as a former coach.” Berenson was named the 2015–16 Big Ten Coach of the Year. He was hired by Don Canham in May of 1984. Under Berenson, the Wolverines have qualified for the NCAA Tournament in 23 of the past 27 seasons. His run of 22 consecutive appearances from 1991-2012 marks the longest streak ever in college hockey. Berenson was one of the best players in Michigan Hockey history, earning All-America honors in both his junior and senior seasons (1961, ‘62). His 43 goals and nine hat tricks in his last season still stand as Michigan records. Berenson holds two degrees from the University of Michigan, his bachelor’s degree from the School of Business Administration in 1962 and a Master of Business Administration degree in 1966. 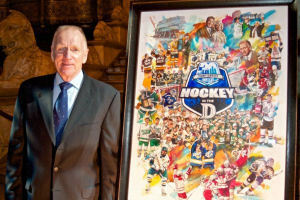 Berenson played in the National Hockey League for 17 years as a member of the Montreal Canadians, New York Rangers, Detroit Red Wings and St. Louis Blues. A six time NHL All-Star, he scored six goals in a game in 1968 for the Blues. He retired as a player in 1978 with 658 career points. Following his playing career, Berenson became a coach. The high point in his NHL coaching tenure was a team record for St. Louis of 107 points in 1980-81. This gained him the Jack Adams Award as Coach of the Year. In 1982 he joined the Buffalo Sabres as an assistant under Scotty Bowman. This arrangement worked well until Berenson received the offer to coach at his alma mater. A native of Regina, Saskatchewan and right out of Junior hockey he played for the Belleville McFarlands (Ontario) that won the World Championship in March of 1959 over the Soviet Union in Prague, Czechoslovakia. He prided academic achievement while coaching at Michigan and encouraged players that left his program early to pursue pro hockey to continue progress on their degree.